Have you ever wondered that whether your friend reads your mail or not? He/she is not replying or didn't see your mail. Whether your important mail reach to its destination. If yes then here is Spypig for you. 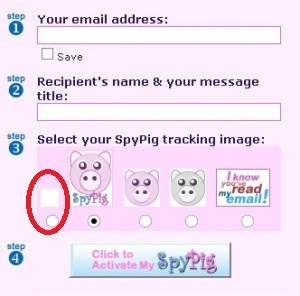 Spypig is a cool & free email tracking system that sends you a notification mail whenever recipient read your mail. 2). Enter your Email id and message title. 3). It provides special image which contains tracking code, select 1 of the image provided. If you dont want that your recipient know about this tracking then select blank (white) image provided. 4). Select no of notifications you want and then press activate. 5). Now it will generate an image copy that image in your mail. Now whenever your recipient open that mail you will get a notification email.